I have come late to Christopher Moore's PI novels featuring Vincent Calvino. And that's been my loss. Moore has lived in Bangkok for twenty years, and it shows. His knowledge of the hidden Bangkok, the crime, the politics and the people shines through. And his writing recalls the gritty noir of Chandler and the intrigue of Le Carre with a dry humour thrown in. 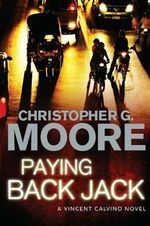 Paying Back Jack is the tenth Calvino novel, and together they represent a rich panorama of east meets west. This time round Calvino is drawn into the murky world of private prisons, political assassination and UN officialdom. Calvino is the hard-boiled successor of Philip Marlowe, a damaged, beaten-down but never beaten protagonist who doesn't know when to quit. The Bangkok he inhabits is full of life, corruption and broken dreams. Moore drags you in to experience all of it. Whether you try it for the exotic setting, the hard-boiled hero or the intrigue and action, you won't be disappointed. And you'll be back for more!